I love staying in touch with old friends and colleagues, even when they live on the other side of the world. But that is something which I would have done anyway, in most cases. No, it’s the strangers and their responses that intrigues me. People seek a connection with you because of a common interest and in some cases those people become friends.., even though we’ve never met in real life (although some I actually do meet, @SchmoozyFox). And then there’s the ‘famous’ people. I do social media at work and therefore I follow quite some people and stories, to stay on top of things, to stay informed. 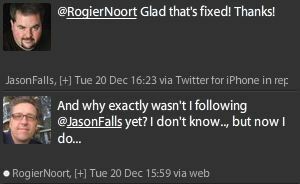 Now I know the ‘gurus’ are busy people with a lot of followers and a lot of mentions and that they actually take time to reply is why I think Social Media is here to stay; (@JasonFalls, @BrianSolis and @MissDestructo for instance). Never before was it so easy to connect with people far away or potentially out of reach. Granted, some people will never reply or connect on a personal level. But those that do make all the difference.